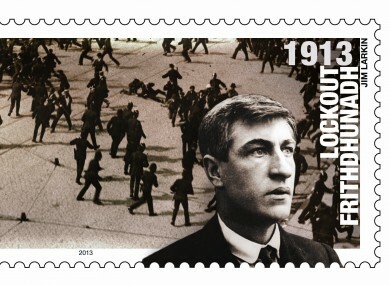 New stamp to mark the anniversary of the 1913 Lockout featuring Jim Larkin. THREE STAMPS FEATURING prominent trade union figures, James Connolly, Constance Markiewicz and Jim Larkin were launched today to mark the 1913 Lockout centenary. The stamps feature photographs from the ‘Darkest Dublin’ photographic collection. The James Connolly stamp has the first ITGWU head quarters building in the background, while the Constance Markiewicz stamp is set against a photograph of children outside tenement buildings in Chancery Lane (now Bride Street). The Irish trade union leader, Jim Larkin is set against a photograph of the Bloody Sunday riot which took place in O’Connell Street just outside the GPO. The riot was sparked when James Larkin was arrested at the Imperial Hotel on Sackville Street (now known as O’Connell Street). The stamps were designed and produced by Irish designer Ger Garland. The launch took place today at the GPO by Minister for Communications Pat Rabbitte, the General Secretary of the Irish Congress of Trade Unions David Begg and the President of SIPTU, Jack O’Connor. I have no doubt but that we have more to look forward to in this decade of commemorations. David Begg, General Secretary of the Irish Congress of Trade Unions said he thought the stamps “capture pictorially the difficult day-to-day experiences of ordinary workers and their families at that time and their heroic determination to achieve decent treatment and fairness at work and, ultimately, radical social change and advancement”. Critical to events of one hundred years ago was the right of workers to organise and to collectively bargain – an issue that has yet to be resolved, along with the timeless pursuit of decent work. The new stamps, as well as a specially produced booklet containing extra background information and stamps, may be viewed and purchased at irishstamps.ie at the GPO and main post offices. Email “An Post launch three stamps to mark 1913 Lockout centenary”. Feedback on “An Post launch three stamps to mark 1913 Lockout centenary”.